Tedea Huntleigh 1260 Single Point, Aluminum High-capacity, off-center loading aluminum single-point load cell is of the two-beam design, and is specially coated to assure durability in harsh environments. Capacities from 50 to 635 kg (110.2 to 1399.9 lb). Complete with 3.1 m/10' of load cell cable, NTEP. 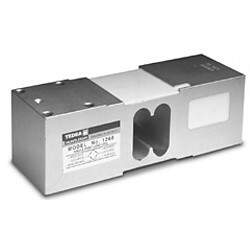 Tedea Huntleigh 1260 Single Point, Aluminum High-capacity, off-center loading aluminum single-point load cell is of the two-beam design, and is specially coated to assure durability in harsh environments. Capacities from 50 to 635 kg (110.2 to 1399.9 lb). Complete with 3.1 m/10' of load cell cable, NTEP. Similar to the Rice Lake Weighing Systems RL1260 and HBM PW16.